30 Minutes on: "I Am Big Bird"
The following is an installment of "30 Minutes On," a regular feature at the MZS blog wherein the author spends exactly 30 minutes writing about a movie, then hits publish. "I Am Big Bird: The Caroll Spinney Story" is a tear-producing machine for any American who grew up watching "Sesame Street." Spinney, who is now 80, originated the character of Big Bird and has played him more or less continuously for almost 40 years, although recently he's slowed down and let fellow Muppeteer Matt Vogel fill in for him. When you see him at work on the Astoria, Queens set of "Sesame Street" performing his most famous creation, you understand why. Puppeteering, like most forms of stage performance, is an athletic skill as much an imaginative one; most of the popular Muppets require at least two operators, but Spinney does Big Bird by himself, and he's not just a half-character who's only seen from the waist up, he's a full-bodied creation who walks around and happens to be eight feet tall. Spinney brings him to life by holding his right hand up over his head: if you think that's easy, try doing that for an hour or two at a time while holding a five-pound weight that stands in for the bird's headpiece, and see how well you do. While you're at it, make sure you're enclosed by a body suit that shuts out light, and simultaneously reading a script taped to the inside of the breastplate and checking your movements on a video monitor strapped across your chest with velcro, and mentally flipping everything you do in order to hit your marks, because the monitor shows what the TV camera sees—i.e., a mirror image. 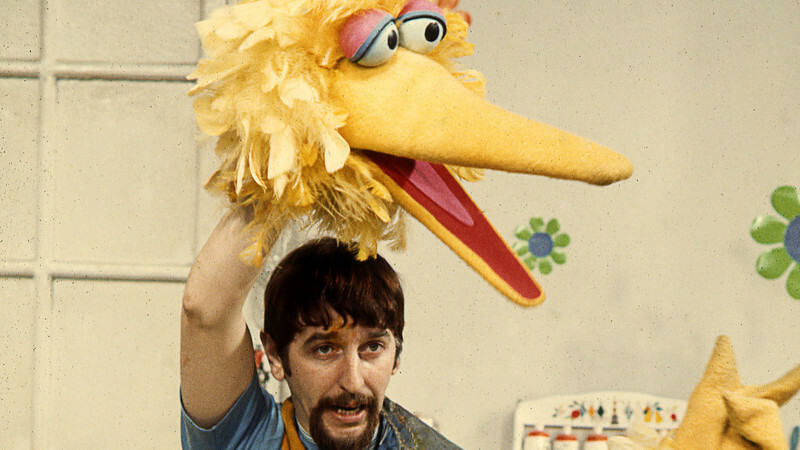 The footage of Spinney performing Big Bird and Oscar the Grouch alongside "Sesame Street" puppeteers, actors and crew comprise the best parts of "I Am Big Bird." Co-directed by Dave LaMattina and Chad N. Walker (a team that also wrote, shot and cut the movie), this is not a hard-hitting investigative look at anybody or anything, although it does feature a few off-color bloopers, and some anecdotes revealing that the people who make "Sesame Street" have egos and issues just like any artists, and sometimes lose their cool or behave unprofessionally. (Spinney's rocky relationship with one of the show's key directors is proof that no matter how nice you are, some people will never like you, and the section about Big Bird being supplanted in popularity by Elmo has a bit of an "All About Eve" flavor, although the filmmakers appear to be pulling their punches for diplomacy's sake.) Mostly this is a feature-length valentine to one of the sweetest characters ever to appear on TV screens (and also movie screens — the bird had a cameo in the first Muppet movie and got a solo film, the very good "Follow that Bird," in 1983). And of course it's a celebration of Spinney himself, who overcame a difficult childhood and seems (rather like his mentor Jim Henson, and Frank Oz maybe, and probably a lot of other puppeteers) to be a melancholy soul. Spinney's wife, kids and colleagues agree that the key to Spinney's greatness is his ability to channel the child inside of him—a child that a lot of us have lost touch with, or at least can't immediately access. He can see the world through innocent eyes and respond accordingly, immediately, without his voice or gestures seeming studied, always dredging up responses that feel honest. There are many powerful moments in the movie, some rather small-scaled (often having to do with the way Spinney nearly bursts into tears recalling difficult moments in his life; his eyes are slightly red throughout) and others monumental. The showstopper is footage of Spinney performing a solo version of Kermit the Frog's theme song "It Isn't Easy Being Green" at the memorial service for his friend Jim Henson. The word "heroic" gets thrown around indiscriminately in descriptions of performances, but it applies here. Henson plucked Spinney from obscurity because he immediately sensed that the younger man was a kindred spirit. That feeling originated in their sense of life (they both had kind of a sad upbeat-ness, if that makes sense) and that memorial service was a stage upon which everything Spinney learned from Henson, and everything he thought and felt about him, could be expressed, and had to be expressed, in a song lasting three minutes, with no accompaniment but a solo piano, while wearing that enormous suit. The performance was flawless. The show went on, and will go on. Although this film doesn't go as deep as I might have liked, and often overdoes the tear-duct stimulation (the elegiac orchestral score is a bit much, and a bit loud; it kept making me want to check IMDB and see if Spinney died while being interviewed or something) it's essentially a celebration of goodness, at times an advertisement for it. As such it should be considered a success; and its subject is so beloved that it could have been a bad movie (it isn't, not by a long shot) and still move people. Goodness is in short supply in popular culture, and when we do see it depicted, it's often mocked, or knocked into the dirt by the artist, to disabuse us of the idea that being decent is anything but a sucker's game. "I Am Big Bird" would never do a thing like that. It believes in Spinney, believes in the character, believes in what it's saying. It took me back to the first time I ever interviewed Spinney, while visiting the set of "Sesame Street" in 1998 to do a 30th anniversary piece about the show's debut. I watched him perform the character in a sketch, then watched as assistants helped him off with the top part of his costume. Then he walked over to me in his giant foam feet, TV monitor-brace still strapped across his torso, and said, "Caroll Spinney," in that unmistakable voice, and reached out his hand. As I shook it, I burst into tears. I was 29 years old and a professional journalist, mind you. It was the voice that did it. It made me feel five again. "I'm sorry," I said. "I'm so embarrassed. Nothing like that has ever happened to me before." Spinney put a hand on my shoulder and smiled and said, "Really, it's OK. I get that a lot."